Debuting in 2008, flumpool went from strength to strength and soon became the eye of the typhoon that was to whip up a storm in the music scene. Making their debut in the same year was NICO Touches the Walls. With a carefully refined band sound, they have proven the potential of their rock at numerous festivals. Two four-man bands, born in the same generation and debuting at the same time, who have walked different paths to get to where they are today, made first contact at Osaka's Namba Hatch in May last year during the event 'GOLDEN CODE'. As they played the melodies of a new generation, the bands only spurred each other on. It was precisely because the two bands share so much in common that a camaraderie as well as a rivalry as musicians blossomed. Soon after that, flumpool played a two-day show at Nippon Budokan in October to great success and released their first full album in December, only gaining in speed and strength as they went along. flumpool released their third single of 2010, 'Kimi Ni Todoke' on Sept 29, to be used as the theme song for the movie 'Kimi ni Todoke', and will be moving onto a new stage, Yokohama Arena and Osaka-jo Hall in December. NICO Touches the Walls too started afresh with a new management company in April and have conquered major festivals throughout Japan throughout the summer! In addition to a live show at CC Lemon Hall in October, with tickets being completely sold out the day they went on sale, NICO is also singing the opening theme to 'NARUTO – NARUTO - SHIPPUUDEN' and is gaining momentum. Despite their hectic work lives, members of the bands have continued to interact and deepen their bonds and it was in the midst of that that NICO Touches the Walls proposed, 'Let's fight our feelings out on stage!! ', which flumpool accepted. With the strong determination of the bands' members to see this realized, the plan for a Split Tour was formalized within no time, before their passion had time to cool. This Split Tour will see both bands take the stage January 2011 at ZEPP Tokyo/Nagoya/Osaka, more mature and with a multitude of new experiences under their belts since May 2010. This tour will also be the first time the bands embark on a joint tour. The tour is a dream come true for the two bands, so expect friction and sparks to fly as the competition heats up onstage! NICO Touches the Walls first broke the news during their Sept 25 performance of their NICO Touches the Walls LIVE2010 EASTxWEST アポロとルーナ～Day of Apollo～ at Osakajo Ongakudo. I know this is extremely old news. But it has never been posted here. Plus someone said Arama needs more posts about artists. lol Of course. 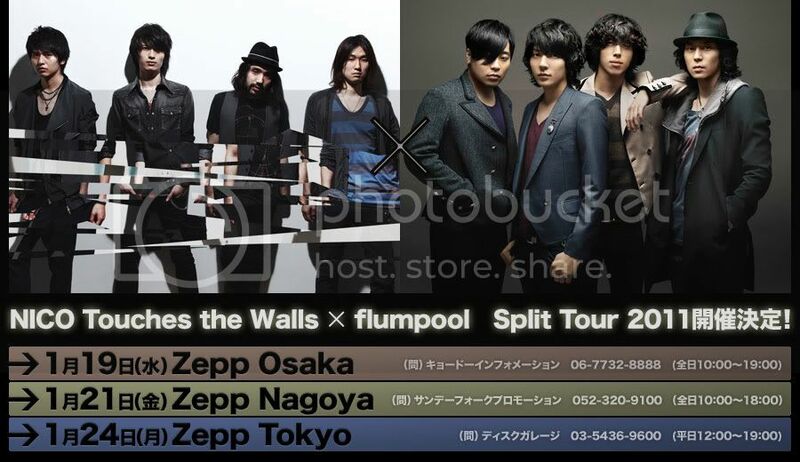 Must spread NICO and flumpool love! I should've done it sooner. Someone mentioned in a NICO post earlier that it has been very difficult to get tickets to flumpool's lives since budokan. I was actually surprised that the Osaka Jo tickets sold out in a day. That is going to be one awesome tour!